This recipe comes from a Pillsbury Idea Recipes sheet and found in a large collection, date unknown. Recipe is typed below along with a scanned copy. In medium skillet, brown ground beef or sausage, seasoning to taste. (No need to brown pepperoni.) Drain well. Set aside. Lightly grease and dust with flour or cornmeal 14 or 12-inch pizza pan or 15×10-inch jelly roll pan. Prepare Batter. No need to sift flour; measure by lightly spooning into cup and leveling off. In small bowl, combine flour, salt, Italian seasoning, pepper, eggs and milk, mixing until smooth. Pour batter into pan, tilting pan so batter covers bottom. Arrange Topping of meat, onion and well-drained mushrooms over batter. Bake on low rack in oven at 425° for 25 to 30 minutes until pizza is deep golden brown. (Deep brown gives a crisp crust.) Remove from oven; drizzle with pizza sauce and sprinkle with cheese. Return to oven for 10 to 15 minutes. Tip: For 13×9-inch pan, use 3/4 cup flour, 1/2 teaspoon salt, 1/2 teaspoon Italian seasoning or leaf oregano, 1/8 teaspoon pepper, 1 egg and 2/3 cup milk for batter. Top with 3/4 pound browned ground beef or sausage or 1/2 cup thinly sliced pepperoni sausage; 2 tablespoons chopped onion, if desired; 1 can (2 oz.) well-drained mushroom stems and pieces, if desired. Prepare and bake as directed above. Top with 2/3 cup pizza sauce and 1/2 cup shredded Mozzarella cheese. Bake as directed. **If desired, use 1 can (8 oz.) tomato sauce, 1 to 2 teaspoons leaf oregano and 1/4 teaspoon pepper as a substitute for the pizza sauce. As a bride in 1969, I made this pizza recipe for the very first time. My copy of the recipe looks just like the one above this message! My new husband (at the time) said he had never had better. Over the years, I’ve refined the sauce to suit our tastes, but the basic recipe remained the same. 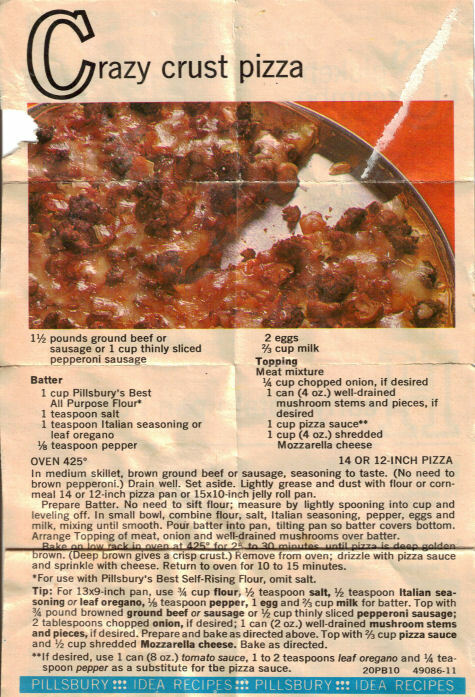 This was the only pizza my mom ever made when we were kids…early 1970’s. Loved it when she made it and I’d been looking for the recipe, made with ground beef, for years. So happy to have found it!